This weekend was so wonderful! A HUGE THANK YOU to those of you who wished me a Happy Birthday and to those of you who celebrated with me! It means a lot to me that you could partake in my special day! Thursday night started the celebration with our family. September 19th is my brother-in-law's brother's birthday as well (but we all just refer to each other as brother-in-laws and sister-in-laws because well, close enough!) so we always celebrate as a big family. 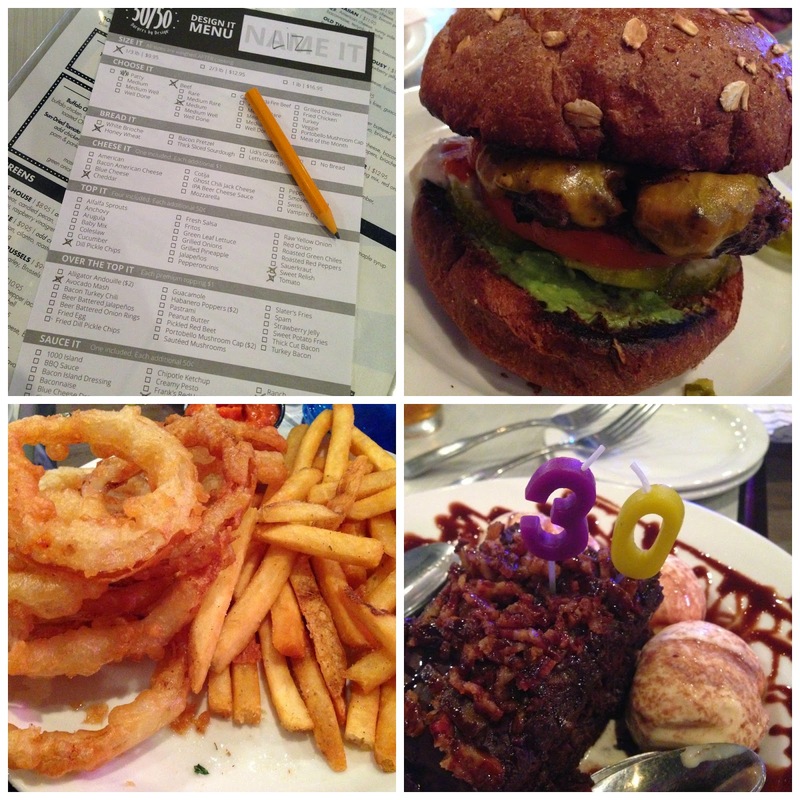 This was his year to pick where we went and he made a great choice - Slater's 50/50. For those of you who have been before, it's amazing, right?? And for those of you who haven't... look up their website and GO! Anyway, Scott is a firefighter and had to work 3 - 24 hour shifts starting on the 19th so we celebrated one day early. Disclaimer : I ate a lot... and not very good (taste-wise GREAT but health-wise not so good) this weekend. Please be ware of all the food photos coming! The food finally came and it was definitely worth the wait! I got the bacon brownie sundae for dessert and Scott got something else. Both were delicious! My brother-in-law, Shawn, got one of the maple bacon milkshakes to share and OH. MY. GOODNESS. was it GOOD. Seriously bacon and maple syrup and vanilla ice cream. Heaven. ... a note on my desk drawer where I keep my purse telling me to open the drawer followed by my whole drawer full of candy! Then two of my other co-workers bought me lunch. 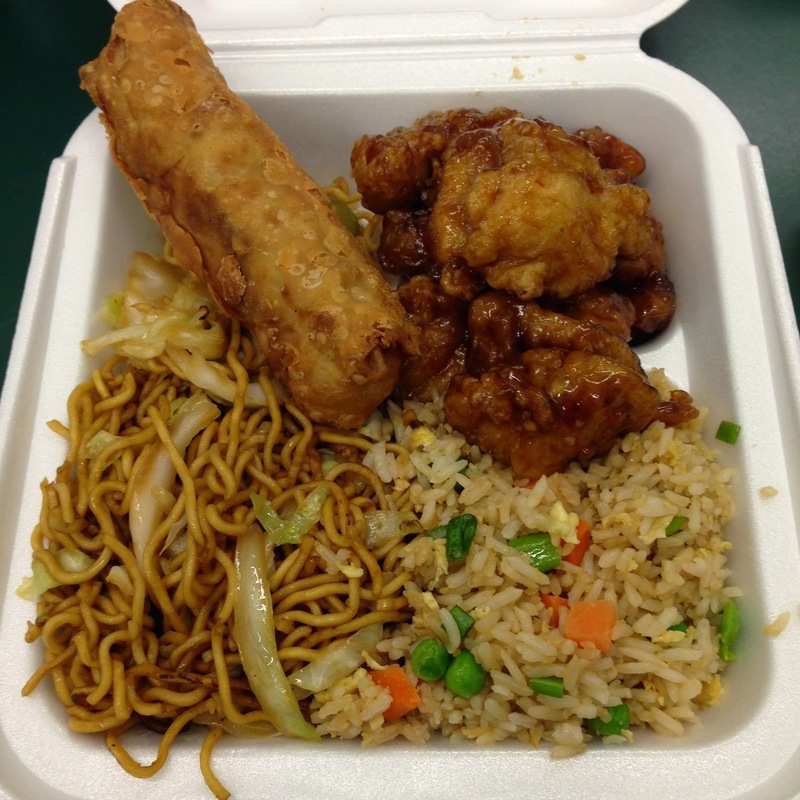 Our Friday work favorite - Panda Express. Friday night I went out to dinner with my friends at Javier's and this handsome fella was my date. Saturday morning we went over to Seth's grandma's house for a lox and bagels breakfast followed by a make-up Gymboree class and a nap for the little guy. ...and his favorite part was playing with the trains and the train table (and standing this.close to the tv that was playing a Thomas movie). 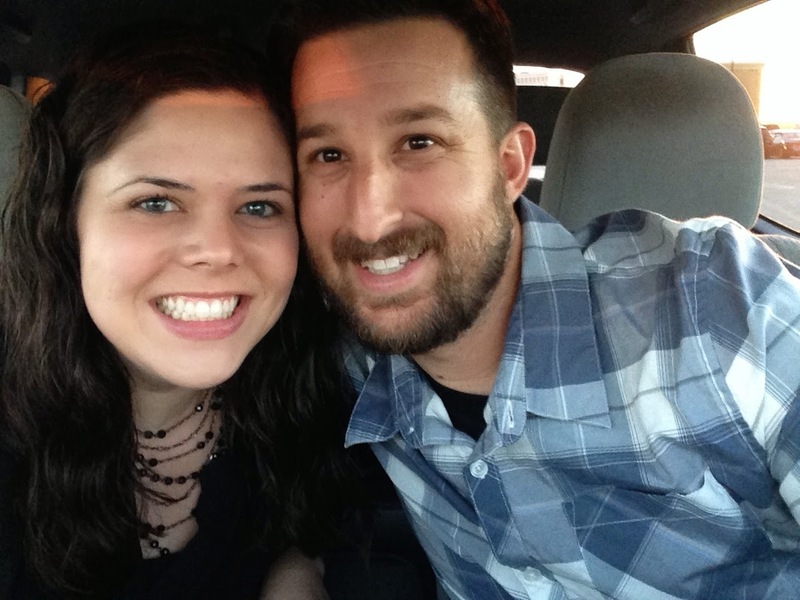 After Mason's hair cut, we had our first fall date night ... family date night. We used it to celebrate my birthday as a family - just us three. And we went to Woodranch - one of my favorite restaurants. I ordered my favorite drink (raspberry pomegranate martini), had my favorite rolls as an appetizer (they have the BEST rolls!) and ate my favorite salad (BBQ chopped salad with tri tip) for dinner. It was the perfect end to my birthday weekend and the perfect start of fall. Sunday we did lots of laundry and grocery shopping, went to swim lessons and Gymboree, and enjoyed a free birthday Starbucks drink. And when it's free? You always go big. Now tell me! What fall fun have you been having? That looks like a super awesome birthday celebration!!! Yummy food, drinks - alone time and family time! Plus Chinese for lunch - Yummy! I miss me some Chinese food! Happy birthday again so glad you had fun celebrating! Welcome to the 30s club! 'I got the bacon brownie sundae for dessert and Scott got something else. ' hahaha oh man I don't know why that made me laugh so hard but it totally did and then made me cough. Cause I'm old and wheezy apparently. hahahaha love the pic of Mason standing this.close to the TV. Yeah he wanted a really good view. A multi-day event to celebrate your birthday is a must! You celebrated awesomely (<-- is that even a word? Did I just make it up??)!! Amazing birthday weekend!! You totally deserved it! And a bacon brownie sunday? I've never heard of that but I waaaaaaaaaaaaan! Totally drooling at 7am, ha ha! LOVE your bucket list! Hope it cools down for real over there! The weather on so Cal has been crazy! Sundae** I meant to fix that before I hit enter, HA! So glad you had a great weekend! Those food pics... oh my. Everything looks so, so good - especially the desserts and that martini! Love that you got to have a date night and then a family date night. Seriously sounds like the perfect birthday weekend! What a great birthday! All that food looks awesome! I love that your coworkers were so thoughtful! next year i'm totally celebrating your birthday with you. 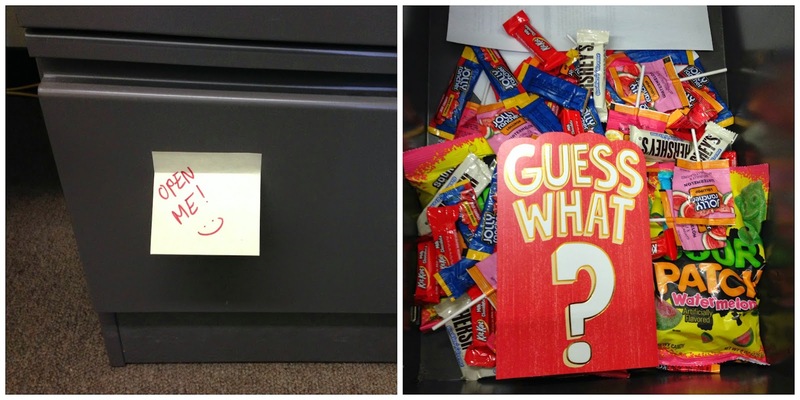 a drawer full of candy and that amazing food?! SIGN ME UP!!! that's amazing!!! So happy you had such a fabulous celebration! Wish I could have been there with you to celebrate! LOVE LOVE LOVE YOU! Looks like you had a wonderful birthday weekend with lots of delicious food! That bacon brownie dessert sounds amazing. What a fabulous weekend you had! Welcome to the Dirty 30 club! What a fabulous way to celebrate turning 30! 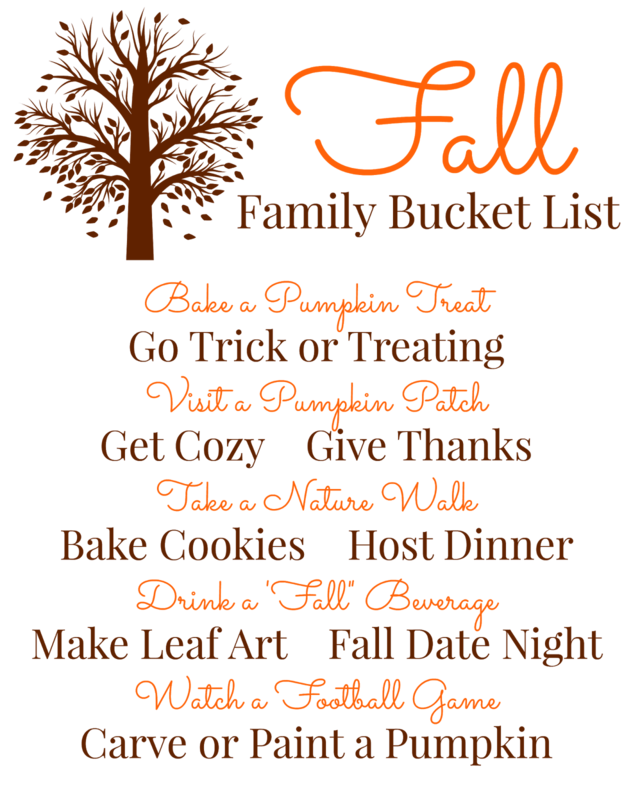 So this fall bucket list link up... Is this a one time thing or every week for a while?? Yay for the first day of Fall and celebrating 30! I think when you get older the best part of birthdays are the yummy food you get to eat! Going places you don't normally go and ordering more than you could ever eat! Happy birthday again girl.. I'll be joining you in the 30s club next July!